The Fiji National Disaster Management Office (NDMO) introduced a new Mobile Emergency Operations Centre this week, providing the office with a valuable tool for community disaster awareness, improved communication between Emergency Operation Centres (EOC’s), and better response times. The Mobile Emergency Operations Centre, valued at FJD 59,000, was made possible through the Pacific Community’s (SPC), Building Safety and Resilience in the Pacific (BSRP) Project, with funding support from the European Union. The opening of the centre was marked by an official ceremony, during which the EU Head of Cooperation Mr Christoph Wagner handed over keys for the mobile centre’s Nissan NP300 to Fiji’s Permanent Secretary for Rural and Maritime Development, Disaster Management, and Meteorological Services, Mr. Meleti Bainimarama. 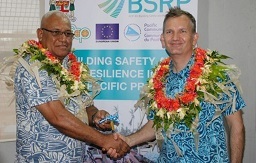 ‘‘We are very proud of the work born out of the partnership between the BSRP Project and Fiji NDMO. This emergency vehicle is a result of the need identified by the Project to strengthen NDMO capacity. What we see here before us is only a small glimpse into a larger chain of activities the Project and NDMO are working on to build national disaster resilience’, Mr. Bainimarama said. In addition to the vehicle, the BSRP project, in partnership with the Fiji NDMO, has refurbished three Emergency Operation Centres (EOC’s) in Fiji, installed water tanks in drought prone areas, and relocated Tukuraki village following a massive landslide. Speaking at the handover, the Head of Cooperation at the EU Delegation for the Pacific, Mr Christoph Wagner said ‘The EU is pleased to support the Fiji NDMO through the provision of an emergency vehicle which will help to link with evacuation centres or health centres. We hope that today’s handover will enable the NDMO to increase the operational capacity of their team before, during and after disasters”. SPC Deputy Director of the Disaster and Community Resilience Programme, Rhonda Robinson highlighted the Centre as part of Pacific wide efforts to be better prepared for disaster response. ‘As we are in the midst of disaster season, the handover of the emergency vehicle is a timely reminder to all Pacific Islanders that we need to take a proactive approach to disaster preparedness. Let us not wait until we hear the warning siren to prepare, we must prepare for future disasters today’.